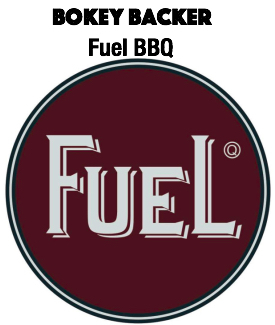 A popular Lake Mary restaurant wants to dump its current city in favor of relocating to downtown Sanford. Owners of Lonnie’s Fusion Cuisine (Website | Facebook), which serves “American food with an Asian flair,” are serious enough about the move to Sanford that they have obtained financing to rehab a building on Palmetto Avenue and have hired architects and engineers to draw up preliminary plans for the renovation. Christina Proctor, whose husband Lonnie is the chef and namesake of the restaurant, says the couple will spend at least $350,000 to build out the space at 113 S. Palmetto Ave., across from Celery City Craft. The proposed plan calls for a courtyard, two private dining rooms, a chef’s table and a small retail space. 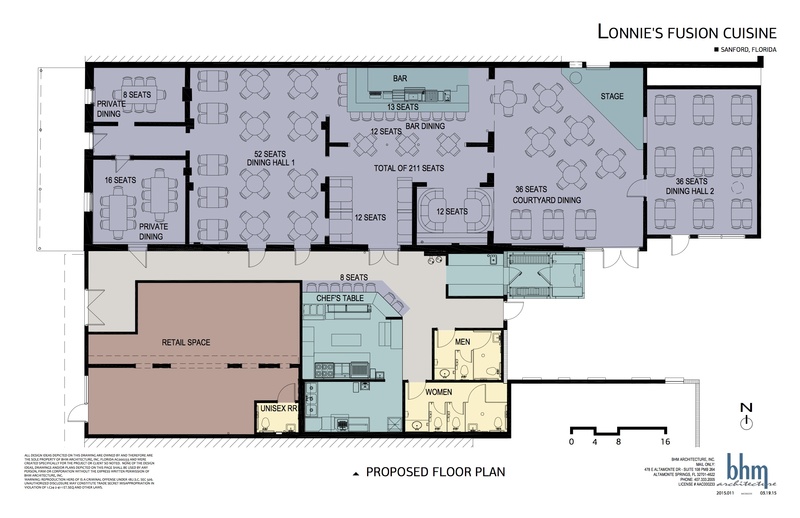 Proposed floor plan for Lonnie’s Fusion Cuisine at 113 S. Palmetto Ave. In the drawing, Palmetto Avenue is on the left side, – Plans by BHM Architects Inc.
Lonnie’s is currently located on 4th Street near Lake Mary City Hall. 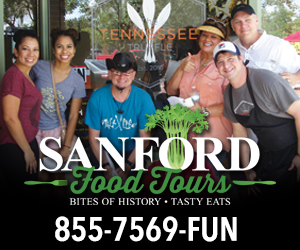 Proctor says a move to Sanford would allow the couple to expand their business in a dynamic downtown. The Palmetto Avenue location would provide substantially more seating, as well as, bigger storage and kitchen areas. “We can’t do everything we want to do with the menu, especially in terms of the fresh fish, because we have just a tiny storage space,” Proctor says. 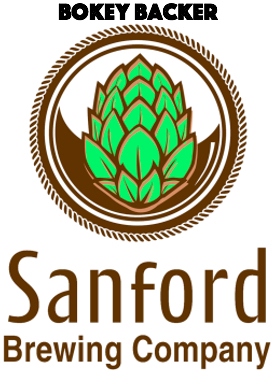 Proctor is no stranger to Sanford. Not only was she born in the old Seminole Hospital, which now serves as the county services building at Mellonville Avenue and 1st Street, her father and grandparents are Sanford natives. “We’ve never been too far from Sanford,” Proctor says. Lonnie’s relocation to Sanford is not a done deal, however. The building is owned by the city of Sanford, which condemned the building in 2005 when the roof collapsed. The city acquired the building in 2008 after the owner refused to repair the roof and racked up more than $100,000 in fines. The city did repair the roof, but the building still needs substantial work and has no plumbing or electrical service. City of Sanford Economic Development Director Bob Turk says the Proctors submitted a formal request on Monday to acquire the building from the city. He says Deputy City Manager Tom George will be putting together a Request For Proposal (RFP) package to see if any other parties are interested in the property. Turk hopes the RFP process can be completed within 60 days. George is on two-weeks leave and was not available for comment. The building has historical significance. It was originally home to the Sanford Police Department, and there are some remnants of the jail cells. “We would like to try to incorporate that into the design of the interior of the space,” says Proctor. Wow, this is really, really great news. We have been great fan’s of Lonnie’s at his current location, and this could really give downtown Sanford a shot in the arm. Let’s hope the often recalcitrant and short-sighted city leaders can actually lead here and help, not hinder, development in the downtown area. This isn’t really simply some abstract recommendation, either.